Hispanic and white populations share 13 of the 15 leading causes of death, but their rates of chronic diseases and health risks vary considerably, according to the first national study on Hispanic health risks and access to health services in the United States. 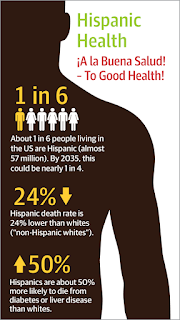 The CDC used recent national census and health surveillance data to analyze the health of the US Hispanic population, the largest minority group with almost 57 million people. Heart disease and cancer claimed the most lives in both groups, but the overall death rate among Hispanic individuals was 24% lower than among white individuals. Among Hispanics, cancer prevalence was 49% lower, the rate of heart disease was 35% lower, and smoking was 43% less prevalent compared with whites. But Hispanic individuals were 50% more likely to die from diabetes or chronic liver disease and cirrhosis compared with white individuals. Rates of diabetes, obesity, and poorly controlled hypertension also were higher among Hispanics compared with whites. Both groups had similar death rates from kidney diseases (Dominguez K et al. MMWR Morb Mortal Wkly Rep. 2015;64:469-478). Foreign-born Hispanic people tended to be healthier than those born in the United States, with the exception of having total cholesterol levels that were 45% higher compared with Hispanics who had emigrated to the United States. Among US-born Hispanics, however, rates of obesity, hypertension, heart disease, and cancer were higher compared with their foreign-born counterparts. About 1 in 3 Hispanics has limited English proficiency and about 1 in 4 lives below the poverty line. The investigators recommended that health professionals use interpreters to eliminate language barriers and engage community health workers (promotores de salud) to provide culturally and linguistically appropriate outreach to Hispanic patients.